Stubbs (center) poses with her mother Phoebe '85 (left) and Dr. Ruth O'Keefe (right), Professor of Accounting. O'Keefe taught both Stubbs and her mother when they attended JU. 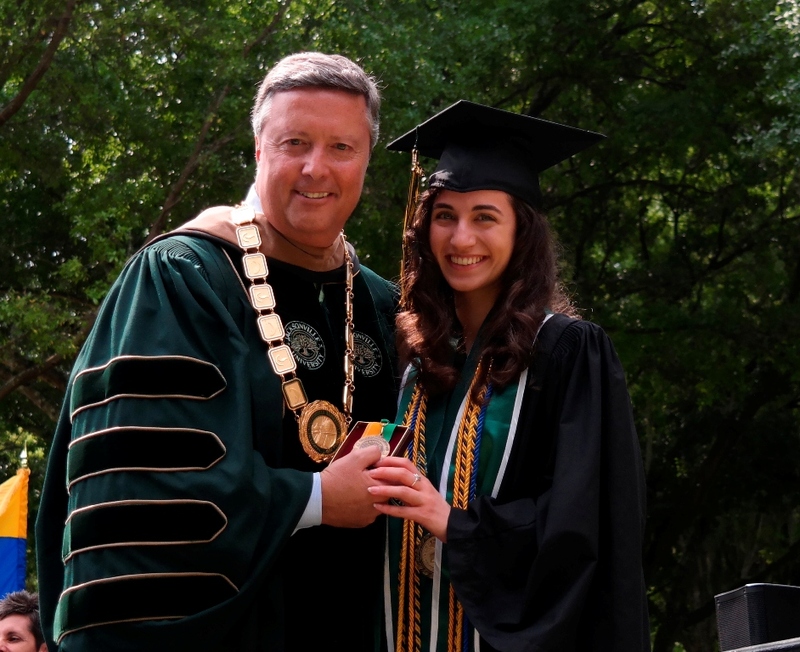 Her curiosity to learn and drive to explore things that excite her motivated graduating senior Alyssa Stubbs toward success at JU. A Jacksonville native, Stubbs is a second-generation JU student. Her mother, Phoebe (George) Stubbs ‘85, and her four aunts and uncles all attended Jacksonville University. Despite the family connection, Stubbs’ decision to attend JU was not a foregone conclusion. Alyssa Stubbs is presented the Fred B. Noble Gold Medal for Scholarship by President Tim Cost at Commencement April 25, 2015. She ended up at JU because it “won my heart with the Honors program. When I interviewed, I felt there was a great community with students and faculty. Faculty are very intimately involved in their students’ lives,” she said of faculty members, particularly Dr. Janet Haavisto, director of the University Honors Program. “It is definitely about the scale and depth of community, along with the beautiful [JU] campus. The beauty is not superficial; it’s real,” Stubbs said. Throughout her four years as a double major in Accounting and English, Stubbs has had numerous experiences across campus, including involvement in the student newspaper, The Navigator, where she served as a staff writer since her freshman year and Business Manager during her senior year. She was also involved in the inception of the award-winning student organization Active Minds at JU, which was voted Outstanding New Student Organization in 2013. In addition to these organizations, Stubbs served as historian for the Honors Student Association, mentor for the Honors mentorship program, and Special Events Committee chair of the Brumos Circle of Excellence, which comprises the top 5 percent of undergraduate students in the DCOB. An eight-time President’s List honoree, Stubbs was one of three students to receive the Fred B. Noble award at commencement, given to students achieving a perfect 4.0 grade point average throughout their college career. In addition, she was honored as the English Student of the Year, Accounting Student of the Year and Davis College of Business Student of the Year for the 2014-15 school year. Stubbs was also a member of the inaugural class of the ‘Top 40 Davis College of Business students’ by Advantage Business Magazine in 2013 and Who’s Who Among Students in American Universities and Colleges for 2015. “I am gratified by all the support in DCOB, the professors’ encouragement. I appreciate all the feedback I have received and am humbled by the honors,” said Stubbs. Earlier this year, Stubbs was honored by the Economic Roundtable of Jacksonville with the Marvin Edwards Scholarship Award. She has also received scholarships from the Florida Institute of CPA’s and Phi Beta Kappa and was inducted into the Beta Gamma Sigma and Phi Kappa Phi academic honor societies. In addition to these honors, Stubbs is an experienced researcher, having presented twice at the annual JU Undergraduate Research Symposium, five times at the Florida Collegiate Honors Council conference, and once at the National Conference for Undergraduate Research in Cheney, Wash. She has also served as an intern for the American and Business Research Institute and just finished work as an assistant book editor with Dr. Richard Cebula on a textbook tentatively entitled Economic Behavior, Entrepreneurship and Economic Freedom. 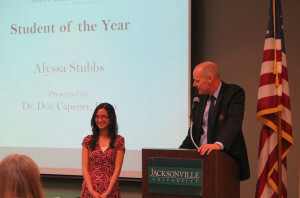 When asked about the greatest thing she learned through all of her experiences at JU, Stubbs cited her ability to learn about JU and its people through her work with the student newspaper. As a reporter for The Navigator, having an objective gave her the courage to talk to anyone. One of her most recent ventures was an internship in merchandising analytics with Interline Brands, an opportunity she received through a corporate connection with Dr. Don Capener, Dean of the DCOB. “I met with Chief Merchandising Officer Jonathan Bennett at Leadership Jax and we talked about partnering to provide a talent pipeline to Interline. Jonathan opened the door and we decided that we needed to start with someone who will impress them. The first student I thought of was Alyssa,” said Capener at the annual DCOB student awards banquet. In addition to the team atmosphere, Stubbs cites a great work environment and great people to work with and for as other reasons for choosing Interline Brands.